Newcastle upon Tyne sits on an ancient site of human occupation. So it’s hardly surprising that offerings to Roman gods can be found among its archaeology. 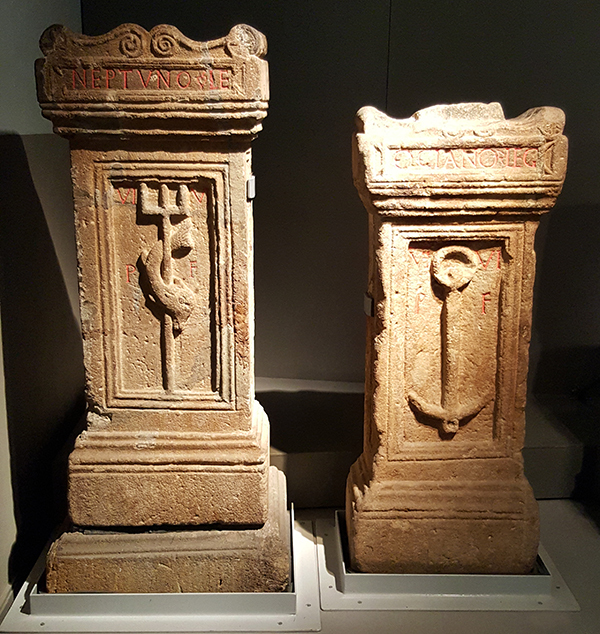 I spotted these altars in the Great North Museum at Hancock and decided to delve further into two of the Roman gods of Pons Aelius. The construction of the Swing Bridge in 1872 led to the discovery of the site of the Roman bridge (Pons Aelius). 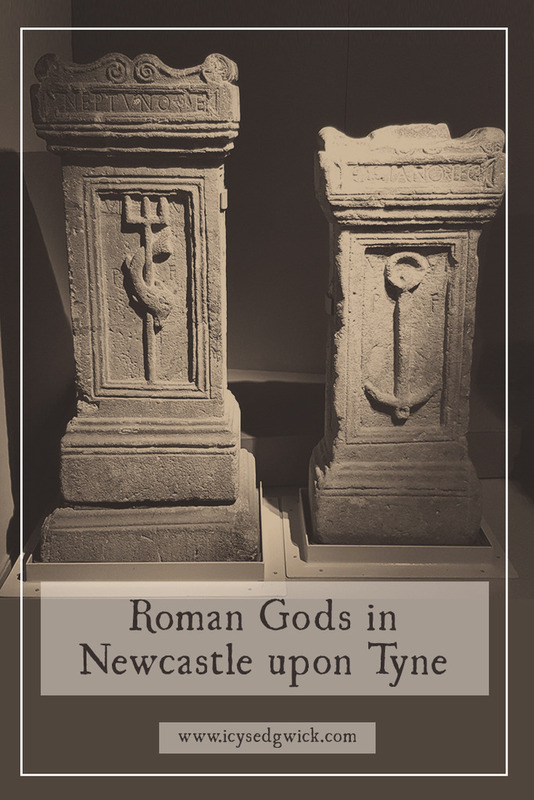 These two altars were found in the river Tyne, right at the spot where the Roman bridge crossed the river. Fun fact: Pons Aelius was the only bridge outside of Rome named after an Emperor (Digging Deeper, 2011, p6). Yeah, the Romans got how important Newcastle was, even if the ‘Northern Powerhouse’ has forgotten we exist. Dedicated to the river god Neptune, the altar on the left bears his trident symbol. Dedicated to the sea god Oceanus, the altar on the right bears an anchor. Both altars were dedicated by the Sixth Legion. Some think the piers stood on either side of the bridge. According to Roman-Britain.co.uk, scholars believe the altars were dropped into the water as part of a dedication ceremony. It certainly explains their location in the mud of the river, which helped to preserve them. Hadrian visited Britain in 122AD and realised his outpost needed a northern frontier wall. A fort at Newcastle guarded the eastern end of the wall. Initially, Pons Aelius only referred to the bridge that crossed the Tyne, but after a while, the name came to refer to the fort too. Pons Aelius just means ‘The Aelian bridge’, after Hadrian’s family name. 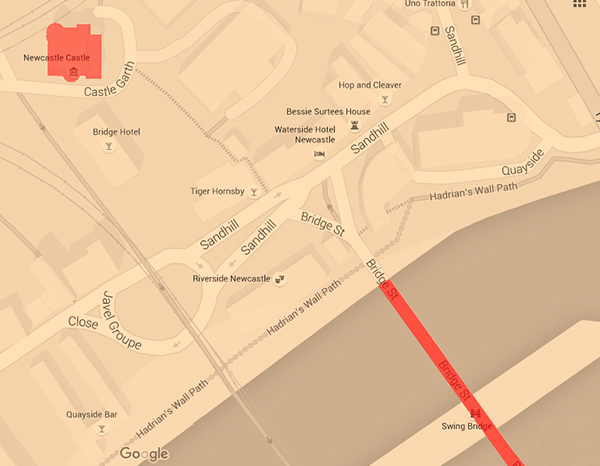 Obviously, the wall ended up extending further, out to Segedunum (now Wallsend). 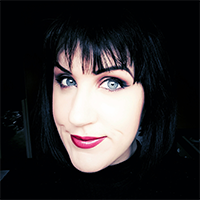 Fun fact: I’m from the part of Newcastle north of where the wall comes into the city…meaning I’m from Beyond the Wall. The Castle Keep, built in 1167, stands on the site of the original encampment. On the below map, it looks pretty far from the river but it sits at the top of a steep slope down to the water. Pretty handy if you’re trying to defend a site. If you’ve ever tried to power walk up either Dean Street or The Side, you know how steep that slope is. But then, if your main goal is defence, then why not get the gods on your side too? It’s unsurprising that the Romans would have chosen water-based gods for their new fort. 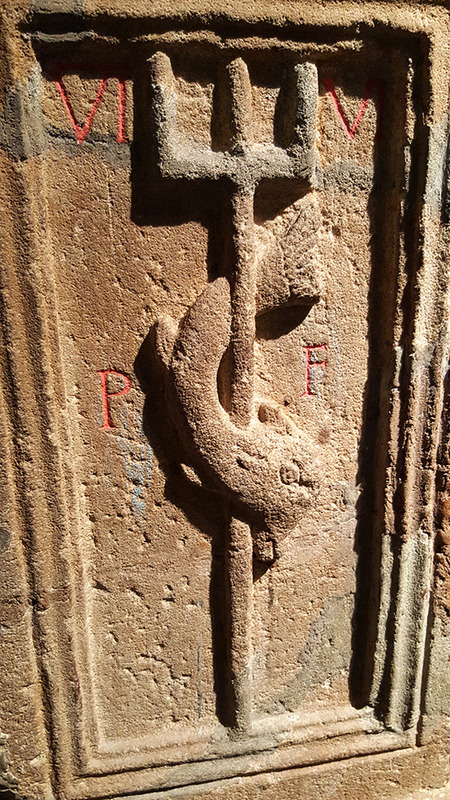 So much about the city relates to water, including our use of seahorses as a common emblem. 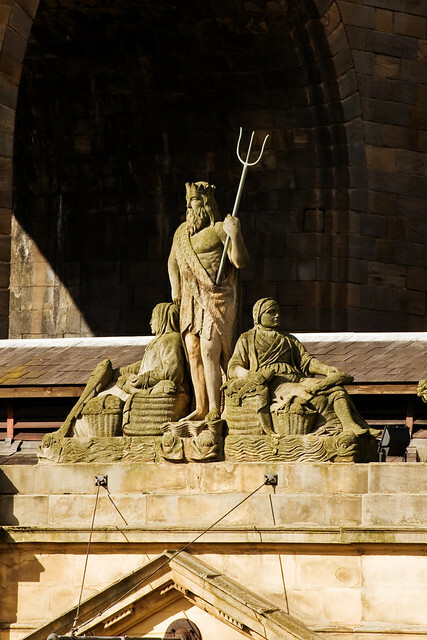 I’ve talked before about the River God Tyne, and how he derives from the Roman idea of the ‘genius loci’. In the Roman era, Neptune was your Go To guy. He still lurks on the quayside, standing on the parapet of the old Fish Market (now a gig venue, imaginatively called the Riverside). As the god of freshwater and the sea, Neptune is often twinned with his Greek counterpart, Poseidon. Scholars argue about his provenance, but plenty of inscriptions mention him near springs, lakes and rivers. His role guarding the sea may be a later addition. He’s always pictured with the trident, but his other symbols include the horse, dolphin, and bull. In Roman myth, his brothers are Jupiter and Pluto (Zeus and Hades in ancient Greece). Usually characterised as a tempestuous figure, Neptune constantly pursued contests with the other gods. He often sent monsters to the lands he wanted to possess or punish. In one myth, Neptune aided Laomedon in building the city of Troy. The king refused to pay Neptune so he sent floods through the lands. Neptune even dispatched a sea monster to the city. Laomedon offered his daughter, Hesione, as a sacrifice. Hercules turned up to kill the monster and save Hesione. Naturally, Neptune’s wrath became legendary. By contrast, fewer myths exist about Oceanus. Both the Greeks and the Romans believed he personified the sea. He also acted as the god of fresh water. Sometimes Oceanus is depicted as being half man and half serpent. His wild hair and bull horns make him sound terrifying. But he was actually one of the more temperate of the gods. Charles Mills Gayley (1991) describes Oceanus’ palace as “beyond the limits of the bountiful earth, surrounded by gardens and all things fair” (p55). Son of Uranus and Terra, he and his sister-wife, Tethys, produced the river gods and ocean nymphs. He appears as a physical body of water in myths, but when he appears in human form, it’s as the father of rivers and streams. In one Greek myth, his daughter is the River Styx. Who better to placate if you’ve built a fort beside an important river? If you look at the Roman gods family tree, Neptune is actually Oceanus’ nephew. Depending on which version you look at, his father is either Saturnus or Cronus, both brothers to Oceanus. Why choose two Roman gods for the same thing? Gayley believes Oceanus rules the sea as head of the Older Dynasty, while Neptune rules as part of the Younger Dynasty. If you wanted to hedge your bets, then making offerings to both would help to ensure you appeased the river. Besides, both gods presented different aspects. Oceanus remained neutral in the war of the Titans. In one myth, Juno even appeals to Oceanus and Tethys during a spat with her husband, Jupiter. As arbiter, Oceanus appears fair and peaceful. A level-headed god, Oceanus avoids conflict and prefers diplomacy. Neptune, on the other hand, represented the chaotic and unpredictable power of the sea. Always challenging the other gods in contests, Neptune is the deity who raped Medusa, leading to her transformation into a Gorgon. Having altars to both of them may help you appeal to both calm sailing, and raw power. Both would come in handy when defending a riverside fort! Which Roman gods appear where you are? Let me know in the comments! Gayley, Charles Mills (1991), The Classic Myths in English Literature and Art, New York: Biblo & Tannen Publishers. Heslop, David, McAuley, Zoe (2001), Digging Deeper: The Origins of Newcastle and Gateshead, Newcastle upon Tyne: Tyne Bridge Publishing. This was a very enjoyable and informative read. Also, Newcastle seems to have a lot of possibilities as a setting for an epic fantasy. Are you a Wilding or an Other?